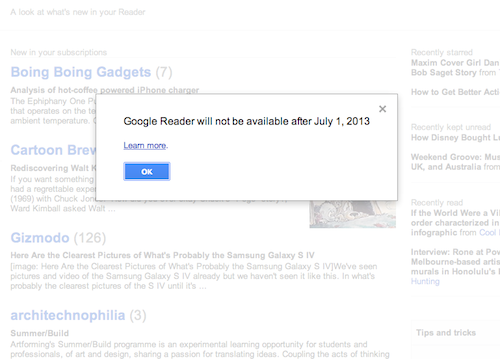 I know that Google tends to shut down services that aren’t used by people much, but Google Reader! Seriously, I live off of that, and so many apps depend on that, we have until July 1st to use Google Take Out and import our RSS Feeds to other RSS Readers. But at least there are options, cloud based would help if you tend to use your RSS Reader from multiple locations like myself, and Desktop based if only from one or two machines, but then comes the problem of syncing for Desktop Feeders, they are still all linked to Google Reader, so how will they sync between each other. I know the desktop based solutions below sync with Google Reader, I’m not sure how they will sync across from each other. No matter what other options there are I can’t believe they are doing this, it’s such a good and simple product, to me I depend on it to get through all my feeds and keep tabs on all the websites I follow and there are a lot and to sync between all my feeds is going to be very annoying. I remember when they cancelled Google Buzz, fine I can understand that, and that collaboration tool that people didn’t know how to use. But Google Reader! Come on Google, just give us this one and let us keep it. Any thoughts people on this? How dependent are you on Google Reader, I know a lot of people don’t read blogs or certain websites as much as they used to but I didn’t think they stopped using Google Reader! Opinions people! I got a notification that my Google Nexus 7 has been shipped as off the 13th of July which was pretty exciting since it was around 3:53 am and I don’t know why I was up at that time. I heard some people got notifications and some didn’t get it yet, but I got mine I stopped worrying, I thought they might pull an Apple and just cancel you for random reasons as usual. Now I can’t wait to get my hands on it, I got the 16GB version and with the hardware its packing, its going to be good. I think I use Dropbox for almost everything, I store everything electronically that I can that is usefull like airline mileage cards, a copy of IDs, bookings in PDF, not including music, videos, and tv shows, and any other form of media that can be stored. A long time ago I go the Dropbox Pro plan which gave me 50 GB and then with the HTC One X they give you the an extra 24 GB, so I had a total of 74 GB. Then recently I got an update from Dropbox a few days ago that I got an upgrade to the account and its not 126 GB which is a pretty nice thing to see since its been a while since they updated their packages. Then I setup a friend’s Samsung Galaxy SIII and I knew they had a package for Dropbox too and since he wasn’t using it I signed up through it and got a nice 48 GB bump to 174.75 GB. I do love Dropbox and now more space to abuse. I made the jump, it was out of stock for a while on Amazon and the other day it said In Stock so I hit the Add To Cart & then the Checkout button right away. It seems that the Zenbook has been an Amazon Exclusive because I couldn’t find it anywhere, and I specifically wanted these specifications. The only thing I’m going to do is do a clean install of Windows 7 Pro or Ultimate which I have without all the random junk installed for it to be even faster. 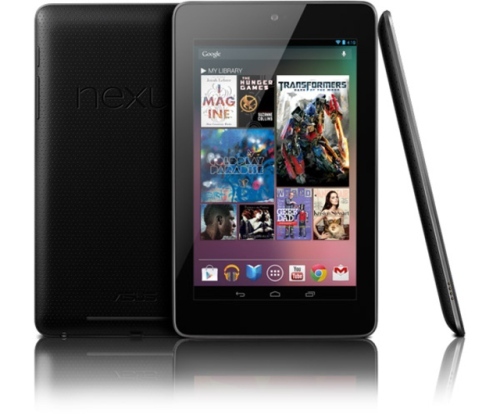 I will probably get my hands on it next week when both the Zenbook and Nexus 7 hit my mailbox. Right now you have a lot of choices for Cloud storage, the first player to the game being DropBox and they have integrated seemlessly into so many services and a lot of people use it naturally. 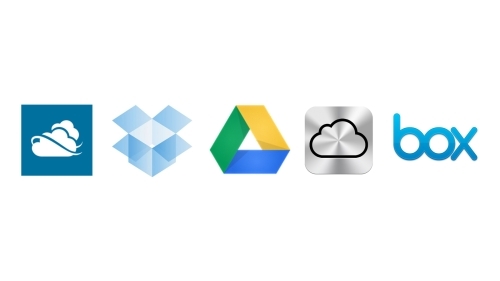 Right now there are several cloud storage services out there: Microsoft SkyDrive, Apple iCloud, Google Drive, Box, & DropBox. I for one shifted my iTunes and current Apple services to the iCloud, it just helped me access my iTunes from my other machines mainly and get my music on the cloud. SkyDrive interfaces with Microsoft very well but thats about it for me, doesn’t really fit my needs since I barely use Microsoft Office. Google Drive is very Google Docs oriented, a bit on the stiff side for me, stills its new and I haven’t had a chance to try it out completely. I haven’t really tried Box which is another independent service. DropBox has all my needs covered for now with an excellent updated online interface, works perfectly with Android & iOS, and does exactly what I need between my machines. 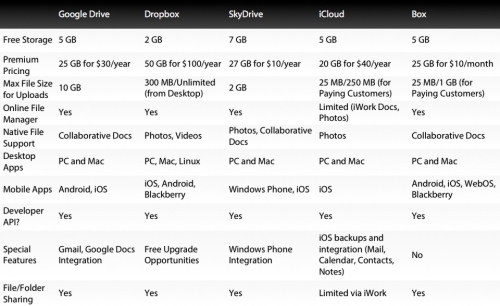 Below is a comparison chart between the different services, the comparison done by Gizmodo, and the only major difference is that DropBox is a bit too expensive and I think they should bring down their prices but it is their core service in this case. You can also check out a more detailed analysis at the link below from Gizmodo, for now I’m sticking to DropBox. 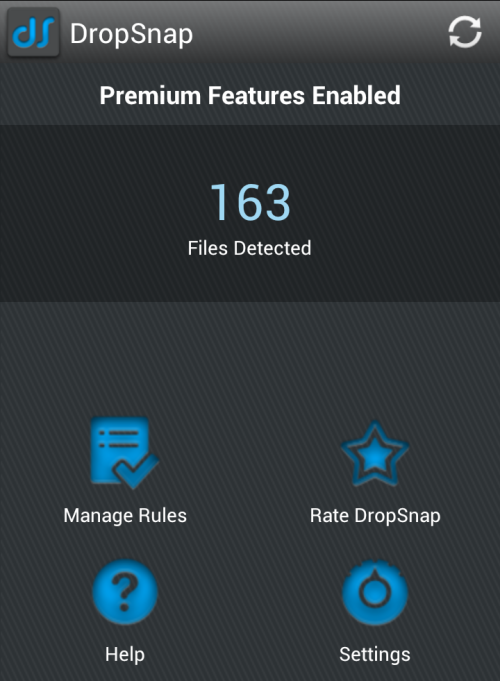 DropSnap Instantaneously Syncs All Your Android Device’s Photos to Dropbox. I am the type of person who is constantly snapping pictures with his phone but then I have to choose which pictures go to Dropbox and manually select them all and upload them. It was a very tedious process, but luckily someone thought the same thing and did something about it. The only way I could think of uploading my pics to my PC without connecting my phone to it was through DropBox and someone had the same idea but created a software to do what I was doing manually. The moment you snap a picture it is saved to a photodirectory directory in your Android phone which DropSnap syncs automatically to a folder inside of DropBox. 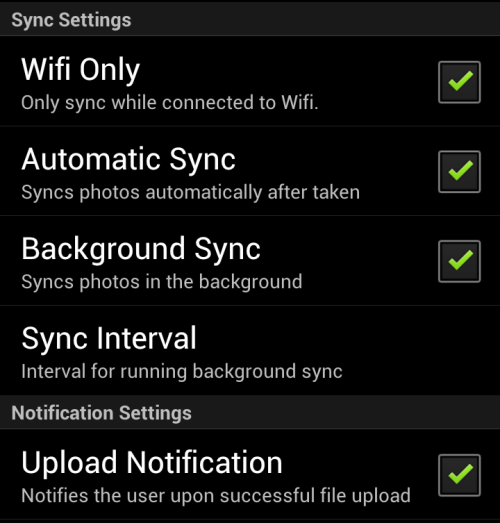 You have several options about how many times a day you can sync, if you want it only over Wifi or also over 3G, but I stuck to wifi because I’m usually connected to wifi where ever I am. 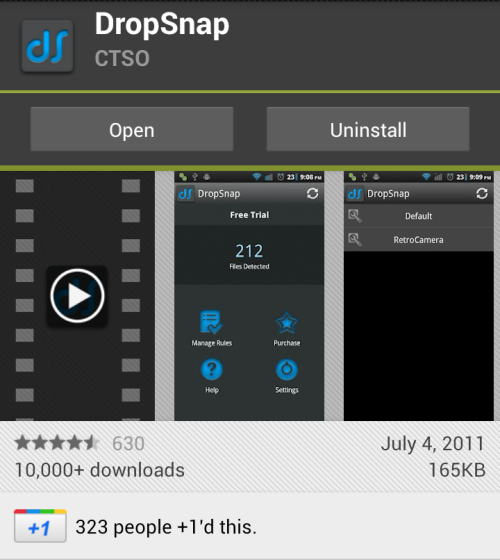 DropSnap is a free download, but requires a $3.99 in-app purchase for automatic uploading to work. If you stay with the free version, you’ll get a notification every time you take a picture, which will let you enter the app and manually sync your photos.